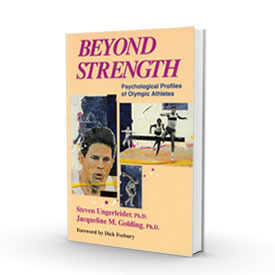 Beyond Strength, co-authored with Dr. Jaqueline Golding, is a large-scale survey of over 1200 olympians, the largest to date. In this very quick read, Ungerleider asks Olympians about their use of guided imagery, visual blueprinting for athletic preparation, and other mental training constructs. An important chapter is devoted to athletes’s dreams and waking imagery on winning and seeing successful outcomes. Beyond Strength includes these unique features: * Practical easy-to-follow explanations. * Specific examples from individuals who use mental practice, imagery and visualization strategies. * Characteristics of elite competitors. * Up-to-date research findings on dreaming, mood profiles, injury prevention, and performance enhancement in a drug-free environment.